Damiana: Latin Meaning: One who tames; subdues. French and Greek Meaning: Untamed. People with this name have a deep inner desire to create and express themselves, often in public speaking, acting, writing or singing. They also yearn to have beauty around them in their home and work environment. People with this name are excellent at analyzing, understanding, and learning. They tend to be mystics, philosophers, scholars, and teachers. 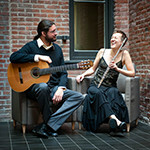 Founded by guitarist Dieter Hennings and flutist Molly Barth, Duo Damiana is focused on broadening the cutting-edge body of repertoire for flute and guitar. Duo Damiana has toured through the United States and México and has presented workshops at prestigious institutions including the Oberlin College-Conservatory, Indiana University Jacobs School of Music and the Cincinnati Conservatory of Music. They have mentored and performed at the Oregon Bach Festival Composers Symposium and at the National Flute Association Convention. Duo Damiana recently released their debut CD “Castillos de Viento” on the Innova label. Described as "ferociously talented" (The Oregonian) and "an exemplary performer" (Steve Smith, the Log Journal), Grammy-Award winning flutist Molly Alicia Barth specializes in the music of today. Contemporary chamber music is Molly’s particular area of interest. Formed with guitarist Dieter Hennings, Duo Damiana is focused on broadening the cutting-edge body of repertoire for flute and guitar, and has recently released “Castillos de Viento” on the Innova label. The Zohn Collective, a new music initiative established in 2017, brings together a core ensemble of musicians with deep musical and personal ties for recording and performance projects throughout the world. 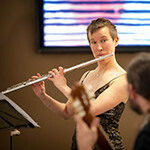 Molly is the Associate Professor of Flute at the University of Oregon, where she is a member of the Oregon Wind Quintet. As a founding member of the new music sextet Eighth Blackbird from 1996-2006, Molly won the 2007 “Best Chamber Music Performance” Grammy Award, recorded four CDs with Cedille Records, and was granted the 2000 Naumburg Chamber Music Award and first prize at the 1998 Concert Artists Guild International Competition. As co-founder of the Beta Collide New Music Project, Molly collaborated with individuals from a broad spectrum of disciplines such as dance, art, sound sculpture and theoretical physics and recorded two CDs and one DVD with Innova Records. Molly previously taught at Willamette University, the University of Chicago and at the University of Richmond. She is a graduate of the Oberlin College- Conservatory of Music, Cincinnati Conservatory of Music, and Northwestern University Bienen School of Music. Molly is a Burkart Artist, and she also plays a 1953 Haynes alto flute. The musical endeavors of Dieter Hennings Yeomans span from new music on guitar to early music for lute, baroque guitar, and theorbo. Mr. Hennings has been a soloist with Canada’s New Music Concerts Ensemble, Tito Sccipa Orchestra of Lecce, Italy, Eastman BroadBand Ensemble, Eastman School Symphony Orchestra, the University of Arizona Philharmonia, the Orquesta Filarmonica de Monterrey among many others. Mr. Hennings has won several prestigious competitions including the 2008 Aaron Brock International Guitar Competition, 2005 Eastman Guitar Concerto Competition, the 2002 Villa de Petrer, Alicante (Spain) International Competition, the 2001 Portland Guitar Competition, among others. Dieter is an active proponent of new music, particularly that of Latin America, having recently worked with composers Mario Davidovsky, Carlos Sanchez-Gutierrez, Juan Trigos and Ricardo Zohn-Muldoon. Mr. Hennings has recently premiered works by composers Jake Bancks, Wes Matthews, John Aylward, Beth Wiemann, Hebert Vazquez, Luca Cori, Juan Trigos and Scott Worthington and many more. 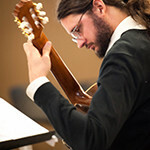 Hennings has received grants from the Howard Hanson Institute for American Music and the Fondo Estatal para la Cultura y las Artes to commission and premiere contemporary works for guitar.